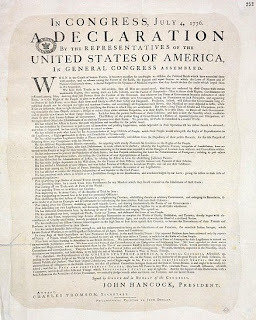 Just in time for the Fourth of July, it has been revealed that an early and beautifully preserved copy of the Declaration of Independence has been discovered in the National Archives in Kew - one of the original "first edition" of 200 printed by John Dunlap on the very day the document was adopted and promulgated in 1776. It was found by an American researcher, apparently among correspondence seized by the Royal Navy during the War of Independence. "The Americans are very excited by it," said a spokesman. Unfortunately it's not for sale, despite the fact that the Archives has at least two more copies and the last one to be auctioned, almost a decade ago, fetched almost £5 million. Every little helps. The Declaration is a quasi-sacred text, not far beneath the Bible in the reverence with which it is regarded by Americans of all political persuasions. But what does it actually say? To mark this weekend's Independence Day, I thought I'd take a closer look. Of course, we all know the rolling, inspired phrases of the preamble. "We hold these truths to be self evident, that all men are created equal, that they are endowed by their Creator with certain unalienable rights, that among these are life, liberty and the pursuit of happiness." But while those words are among the most memorable ever set to paper, and have made the Declaration one of the most precious documents of the human spirit, it is not essentially a statement of abstract principle. It is an argument about the nature of government, about what makes a valid revolution different from treason, and what are the circumstances in which it is not only permissible but beholden upon a people to depose their rulers. But above all it was intended to show how these principles justified the American revolution in particular. In this, as I hope to show, it manifestly fails. But before we come to the causes - which form the heart of the document - there comes the famous claim that "all men are created equal". Quite why that, or the pre-eminence of "life, liberty and the pursuit of happiness" among "unalienable rights" should be "self-evident" (a phrase said to have been thought up by Benjamin Franklin) is unclear. If anything, it is the inequality of human beings, in terms of natural endowments, that is self-evident. Equality is not something bestowed by Nature (or "Nature's God", as the deist Jefferson had it); it is a philosophical position which requires a conscious determination to override the order of Nature to bring even partially into accordance with reality. We may all be equal in terms of fundamental rights - but these are not "natural" rights, however they might be referred to as "human rights", but political rights, belonging to citizens. The language of human rights is these days mouthed by everyone: by lawyers making a career of it; by campaigners against anti-terror laws; by the members of the equality industry; by governments justifying the very repressive measures that others are campaigning against; even by apologists for some of the vilest of contemporary regimes. So the ringing declamation of self-evidence does, indeed, seem self-evident. But it wouldn't have done in 1776. The prevailing sociological theories of the ancien régime - against which the Enlightenment had set itself - descended from earlier views of the Chain of Being, in which status was something inherited and, to a greater or lesser degree, fixed, and in which claims to what we would call "human rights" were based not upon abstract principle but upon the particular privileges to which members of all classes of society, whether peasants, bourgeois, clergy or kings, felt themselves entitled. Even equality before the law was not assumed, although in Britain the principle existed to some extent - more than on the continent - and the American colonists had developed it further. At least among themselves: few extended it to the indigenous inhabitants of the land, still less to the African slaves that many, including (notoriously) Jefferson himself, owned. But the reference to human equality and the attendant natural rights, though it has earned the Declaration much of its totemic status, is in any case not much more than a debating point. It is there to support Jefferson's next claim that it is "to secure these rights [that] governments are instituted among men, deriving their just powers from the consent of the governed". Which is more airy Enlightenment rhetoric, of course. It's not hard to spot the influence of Rousseau and his theory of social contract, although more direct antecedents of the Declaration can be found in the philosophy of John Locke. And, given that it is presented as another of the "self-evident" truths, it may again be wondered precisely what is meant to be self-evident about it. Far more self-evident, to any neutral 18th century observer, would have been the perspective of the servile Persian courtier in Edward Gibbon's Decline and Fall of the Roman Empire (which also came out in 1776), whose "language afforded not words for any form of government, except absolute monarchy" and whose history "informed him that such had ever been the condition of mankind". Jefferson then asserts that, "whenever any Form of Government becomes destructive of these ends, it is the Right of the People to alter or to abolish it, and to institute new Government..." This is the most truly revolutionary statement in the entire document, for it asserts not merely that government to be legitimate requires the consent of the governed, but that government actually belongs to the people as a whole, and that rulers hold it by delegation from the governed. That the basis of authority in society is, in Abraham Lincoln's equally famous formulation, "government of the people, by the people, for the people". But while the Gettysburg Address claimed this as the unique achievement of the United States (which "shall not perish from the earth") the Declaration of Independence asserts it as "self-evident" and the property of all mankind. Which clearly it isn't, or wasn't. But while there are several interesting points of similarity between the two declarations, they rest (as might be expected given their very different historical circumstances) on different foundations. The Scots conceived of a bond of reciprocal obligation between subject and king: if the king failed to uphold the people's rights or govern justly he could be deposed - but only in favour of some other king. In 1776, the American rebels were not looking for a different king. So, revolution - "regime change", indeed - must be a last resort. But now Jefferson has a problem - because the wish of the Americans to govern their own affairs is no longer sufficient justification to rebel. There must in addition be abuses - abuses so intolerable that it has become difficult if not impossible to endure them. There must be insufferable evils, and "a design" for "absolute Despotism". And it falls to Jefferson to enumerate them. This is where the Declaration begins to fall apart at the seams. Once you get past the philosophical argument, it turns into a more-or-less random collection of gripes. The contrast between the inflated assertions made by the revolutionaries and the actual facts that they are able to adduce gives the Declaration an unexpected air of bathos. Jefferson's case is that the colonists have been deprived of their natural and legal rights by the government of George III. He refers to the "patient sufferance" of the the Americans under the royal yoke. "The history of the present king of Great Britain", he asserts, "is a history of repeated injuries and usurpations, all having in direct object the establishment of an absolute tyranny over these states". And, to put it bluntly, whatever one thinks of the policy of George III, Lord North or the British representatives in the thirteen colonies, or of the Stamp Act and the tea tax, that claim is patently absurd. "To prove this" - Jefferson continues, determined to dig himself deeper into the hole of his own creation - "let facts be submitted to a candid world". King George, we are told, has "refused his assent to laws, the most wholesome and necessary for the public good" and has "refused to pass other laws for the accommodation of large districts of people". Very well, Mr Jefferson, which laws did you have in mind? He doesn't say. Instead he accuses the king of having "called together legislative bodies at places unusual, uncomfortable and distant from the depository of their public records, for the sole purpose of fatiguing them into compliance with his measures." Which measures? Where were these unusual places, and who was summoned to them, and when? We are not told. But in any case, if your aim is to establish an "absolute tyranny", the summoning of legislative assemblies would seem to be a strange way of going about it. Why not just send in the troops, and shoot anyone who protests? That would at least have given Jefferson and his friends something to complain about. But there's more. The evil King George has "dissolved legislative houses repeatedly, for opposing with manly firmness his invasions on the rights of the people" (Which ones? When?) He has "endeavoured to prevent the population of these states, for that purpose obstructing laws for the naturalization of foreigners". (These days, anti-immigration policies tend to be popular.) He has "made judges dependent on his will along... for the amount and payment of their salaries". (He has paid people's salaries? Shocking.) And he has "erected a multitude of new offices, and sent hither swarms of officers to harass our people and eat out their substance". That complaint I can empathise with, even if it does make George III sound improbably like New Labour. But, once again, it would be nice to have some specific details. Even when it's possible to see his point, Jefferson manages to couch his complaints in willfully opaque language. Thus, instead of stating plainly that the Westminster parliament should have no right to legislate for the colonies (which was one of the main American complaints) he writes that the king "has combined with others to subject us to a jurisdiction foreign to our constitution and unacknowledged by our laws; giving his assent to their acts of pretended legislation." And for just a moment, you're wondering what the hell he's talking about. And he lists those acts ("for quartering large bodies of armed troops among us"; "for cutting off our trade with all parts of the world"; "for taking away our charters" etc etc) without troubling to name them, or describe how they have been implemented in practice. It's almost as though, knowing that the facts can't possibly justify revolution in the light of the preamble, he prefers to take refuge in vagueness and obscurity. He is at this time transporting large armies of foreign mercenaries to complete the works of death, desolation and tyranny, already begun with circumstances of cruelty and perfidy scarcely paralleled in the most barbarous ages, and totally unworth the head of a civilised nation. But in that case it was no more than the truth. Even by the standards of the 18th century, when French criminals were still being ripped apart by wild stallions or broken on the wheel and the Enlightenment's most popular It-girl, Catharine the Great of Russia, was presiding over a major extension of serfdom, British behaviour in the American colonies was fairly mild. Milder than their behaviour in some other places, indeed, including Scotland (not to mention India). Once again one wonders how a man as intelligent as Thomas Jefferson could have expected anyone to take this sort of language seriously. He has excited domestic insurrections amongst us, and has endeavoured to bring on the inhabitants of our frontiers, the merciless Indian savages, whose known rule of warfare is undistinguished destruction of all ages, sexes and conditions. You won't see that quoted very often. The litany concludes with a description of the amiable Farmer George as "a prince whose character is marked by every act which may define a tyrant". (Like Commodus, perhaps, "immersed in blood and luxury".) Finally, the Declaration asserts that the colonists' many petitions have fallen upon deaf ears: "We have appealed to their native justice and magnanimity, and we have conjured them by the ties of our common kindred to disavow these usurpations". There is nothing for it but to "acquiesce in the necessity... and hold them, as we hold the rest of mankind, enemies in war, in peace friends". There follows the declaration of independence proper, "that these united colonies are, and of right ought to be, free and independent states" and that the leaders of the rebellion "mutually pledge to each other our lives, our fortunes and our sacred honor". Thus the Declaration ends on a suitably high moral tone. But that, like the elevated, universalist sentiments of the preamble, only makes the disingenuous or at least exaggerated nature of most of Jefferson's actual complaints more glaring.